The roots of the Opel company went back to 1862, when young Adam Opel began making sewing machines in an unused cowstall in Rüsselsheim, Germany. Eventually, the company diversified into bicycle manufacture and they built their first powered two-wheeler in 1902. In 1928 Opel acquired the license to build the famous Neander frame, in which they fitted a 500 of their own manufacture. Opel had the ambition of producing a luxury machine to rival the costly Mars and Megola machines. Their "Motoclub" bikes were built in the former Elite-Diamante factory at Brand-Erbisdorf, which had been taken over by the Opel family. 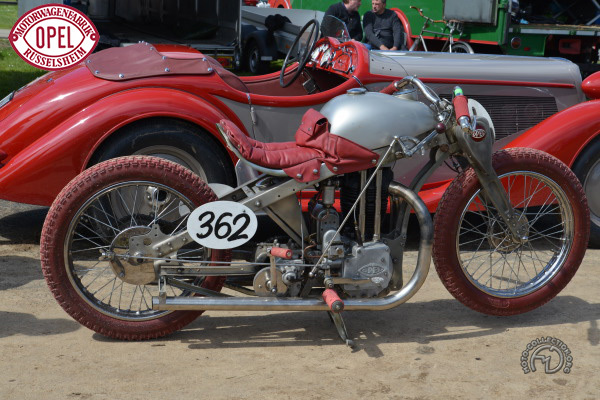 The Motoclub was distinguished by its Neumann-Neander frame, which consisted of pressed-steel beams supporting a light-alloy engine cradle. For the first time, the pressed-steel seat was an integral part of the design. The least successful feature was the front fork, whose short vertical spring leaves, concealed behind a pressed-steel casing, broke frequently. Opel heir Fritz Opel experimented with rocket propulsion and fitted a 1928 Motoclub with six rockets; it was demonstrated on the straightaway of the Berlin Avus track. The stock of 1928 Motoclubs was still being sold off in 1930, by which time Opel had become part of General Motors and its two-wheeler days were over. The highly original Opel Motoclub was not painted but cadmium-plated to resist rust, giving it a characteristic silver finish.